Watch your restaurant business grow rapidly with restaurant open neon signs. 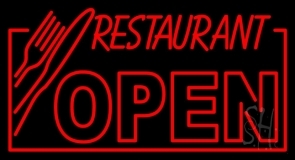 Motorists are sure to come to your restaurant when they will notice the bright glowing restaurant open neon sign displayed on your entrance. An open restaurant neon sign will let your customers know how delicious your servings are! Restaurant open neon signs are easy to install and maintain. Lighting it up for all day and night, all months and year for years will not affect its bright glow. Moreover restaurant open neon signs are made from real neon glass which makes your restaurant clearly visible from distance and extremely radiant at nights. These qualities make restaurant open neon signs as one of the best sources of advertisement for restaurants. 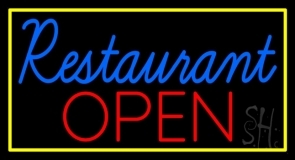 We have distinct restaurant open neon signs that are sure of perfect fit for your restaurant. 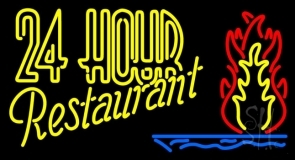 If your restaurant serves food all round the clock then add a 24 Hours Restaurant open neon sign designed with fire flames from our collection. You can also choose from restaurant open neon signs with fork and knife, directional arrow and many more from our assortment. Get your neon sign customized by our very talented designers. Add various effects of flashing, animation, colors, fonts, frames and much more to your personalized restaurant open neon sign and bring in more customers to your restaurant. So make your presence felt in restaurant business adding more to your everyday sales with custom open restaurant neon sign. Contact us for a neon sign today!